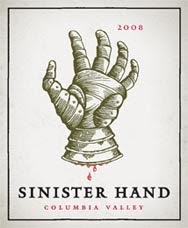 In honor of Halloween, this month’s Virtual Tasting will be the 2008 Owen Roe Sinister Hand. This wine is a blend of Grenache, Syrah, and Mourvedre and retails for $24. A list of on-line retailers and Washington retailers is below. As always, contact the stores to ensure availability. The tasting will take place on Friday October 30th. Please join us in trying this wine and posting your comments either on or before the 30th. For the tasting, I will also be tweeting @wawinereport.com from 7-9pm in addition to posting comments to the blog post that day. Above information generously provided by Dieter Klippstein at Triage Wines. Smokey when first poured, but it dissipates quite quickly and opens up to a round bouquet of spiced berry. Very easy on the palette, extremely drinkable. Certainly worth its 24.99 price tag IMO. Lots of smoke and spice on first pour, seems to lose heavy nose fairly quickly. Second pour brings it right back thought. Seems fairly well balanced with great tannins and acids. Very spicy, with blackberry and clover or allspice. Grenache seems to bring the berry while mouvedre brings the spice. Reminds me of my favorite, easy drinking cotes du rhone wines! Owen roe never lets me down!